Imagine a wastewater treatment facility where people get married, amid 40-acres of restored salmon habitat with designed ponds and wetlands. It sounds far-fetched but it's reality in Snohomish County, Washington, near the border with King County, about an hour northeast from downtown Seattle. In a tour of the Brightwater facility during the American Planning Association (APA) conference by Michael Popiwny, the landscape architect who managed this $1 billion project for the King County government, we learn how wastewater treatment plants can become assets instead of drains on communities and the environment. The key to success was an interdisciplinary management, design, and construction team that was highly responsive to community feedback and deeply sensitive to environmental concerns. Plus, Brightwater was paid for by growth in the region. As new people are attracted to the quality of life the Seattle area offers, they move in and pay a $4,000 - $8,000 sewer hook-up fee. "The fact that new people were paying for the system helped us to sell it to the community." 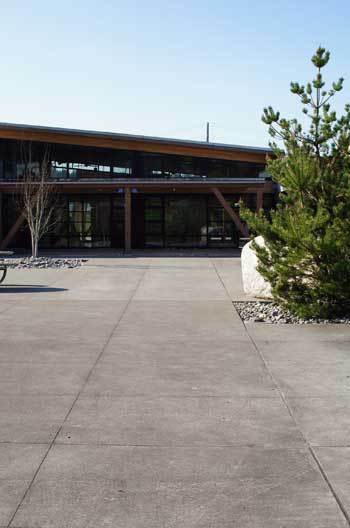 Brightwater, a 15-year endeavor that began operations in 2011, is a wastewater treatment facility, environmental education and community center, and ecological system rolled into one. 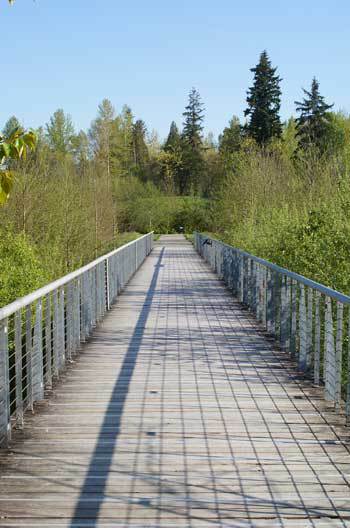 It's a 114-acre site, nestled in a wealthy residential area, with some 70 acres of trails and parks open to the public. There are 13 miles of underground conveyance pipes that direct wastewater to the plant. 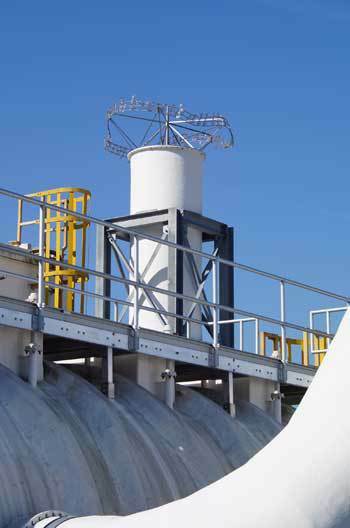 When it reaches the plant, the wastewater is cleaned through the largest membrane bioreactor system in North America, which makes the water 70 percent cleaner than conventional approaches. It is then sent out through a 600-foot-deep outfall pipe a mile out into the Puget sound. Excess materials are turned into "loop," a biosolid that is sold to local farms and orchards at very low cost. However, this description of the system doesn't do justice the experience of being at Brightwater. Popiwny explained the critical role excellent design played in "selling this place to the community." He said, "we realized that this place needed to be beautiful. We need it to be very well designed." Just siting the project won King and Snohomish counties, along with CHM2Hill and Environmental Design Associates, an ASLA 2005 Professional Analysis and Planning award. Then, engineers with CHM2Hill and landscape architects with Hargreaves Associates and Mithun along with restoration ecologists and conservation biologists came together in an interdisciplinary design team to create a welcoming place that actually restored the ecological function of the landscape, turning into a place that aids salmon in their annual migration. Popiwny briefly described the design and construction process: "We had separate contracts for the engineering and design teams. We needed the strongest engineering team and the strongest landscape architecture team. The teams completed their work separately and then we combined their efforts in the final design. Internally, we had an engineer lead the engineering team, and I led the design team. It's important that you set up competitions for top notch talent in each category and then give them equal status." As the deep processing facilities were dug out of the landscape, the excess soil was turned into "decorative, geometric landforms," by Hargreaves Associates. "These landforms alone took thousands of trucks off the highway, saved lots of carbon," explained Popiwny. 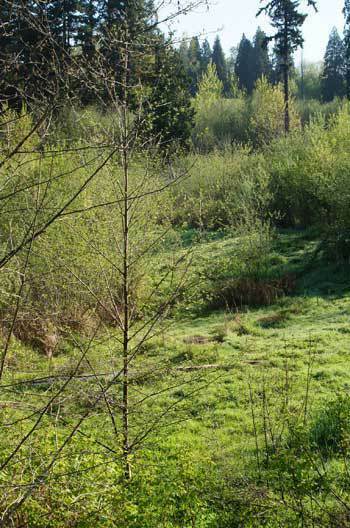 Amid these landforms in the "north 40 acres" is an elaborate system of forests, meadows, raingardens, wetlands, and ponds that hold and clean rainwater before directing it to the streams salmon use. What was once an auto depot is now a place that provides great environmental benefits. 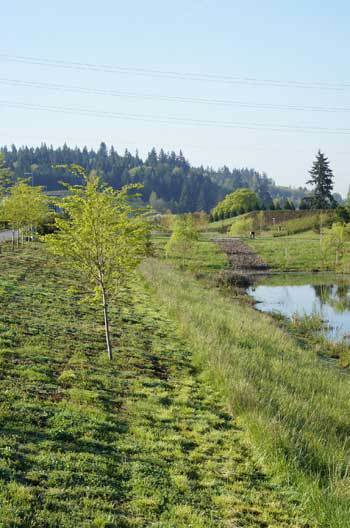 The process of restoring the habitat and turning into a publicly-accessible park was complex, involving stream and wetland biologists, who guided ecological decisions, and landscape architects with Hargreaves. 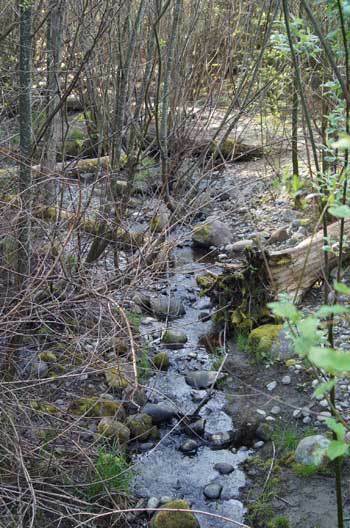 The team used 15 different types of rocks to create two different stream corridors that empty into ponds where salmon rest on their uphill climb to the places where they spawn. "The result is something similar to the original stream." To restore the forested wetland, the Brightwater team made it an environmental education and community outreach project. Kids from the area helped plant over 20,000 native willows. 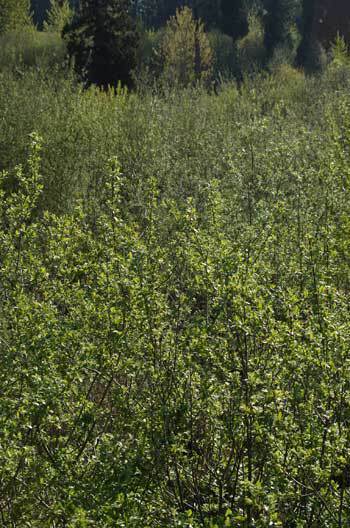 "Native willows are easy for children to plant. We had about 4-6 busloads of kids from the surrounding area per week." This effort really helped create community buy-in and grow a sense of greater investment in the success of the project. As you walk out of the park and into the environmental education center, which was designed and built to a LEED Platinum level, you can see how an open-minded couple would actually want to host a wedding here. Popiwny laughed and said one comment he read about the onsite wedding online was, "it's today -- get with it!" There are pleasing views of the green infrastructure. One of the larger buildings is also a frequent host for local non-profits and community meetings. All of this is a result of efforts to stave off protracted lawsuits that would have delayed the project from the beginning. The parkland, environmental education and community centers, were all part of the $149 million set aside as part of the "mitigation budget." According to Popiwny, "budgeting this kind of work upfront meant saving money over the long run." However, the Brightwater project was still sued by local sewer districts who argued that the project "spent too much on mitigation." The state supreme court eventually sided with Brightwater. Popiwny said "lawsuits are an inevitable part of large projects." Now the challenges to projects like Brightwater are "often in the guise of environmental protection." But Popiwny just sees this as part of the broader system of checks in a democratic system. "There needs to be multiple checks as these projects can affect communities. The region benefited from the opposition to the project as it pushed us towards a higher performance, but it also made it more expensive." 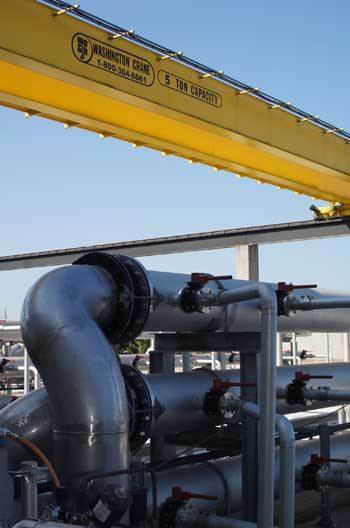 The Brightwater team included other forms of technical fail-safe systems, like multiple, isolated ponds to separate acid or bases if there was an overflow or accident caused by an earthquake, and engineering all pipes and systems to withstand high levels of seismic activity. As we walk out of the environmental education center, which features flexible classrooms for groups of all ages and enables a range of hands-on learning about the water cycle, we head to the facility itself, which is strangely odorless. "There are three levels of odor control." Spread throughout the site is public art, as the project was part of the state's 1 percent for art program. 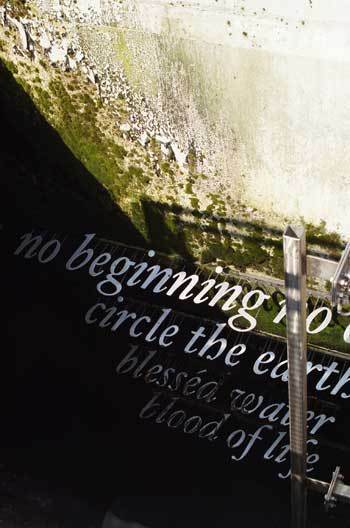 Climbing up a stairwell to the spot where the millions of gallons of cleaned water is sent out to the sound, there is artist Jane Tsong's poem, which actively blesses the elements of the plant (air, water, biosolids) as "they depart from the treatment process and continue their life cycle into the natural world." Popiwny said the facility staff particularly connect with these poems, as it is reminder of how meaningful their work really is.